Communion Sunday at the 10:30 Mass on the first Sunday of the Month. Meetings follow the 10:30 Mass in MR# 1. New members are always welcome. Meet on the fourth Tuesday of every month at 1:30pm in the Hall. The R.C.I.A. process enables interested non-Catholics and Catholics not fully initiated into the Church (i.e., Baptized but not having received Eucharist) to study the Catholic Faith within the context of a small community. Call Monica Smith at 856-661-9489 or Jean Davis at 856-663-4843. 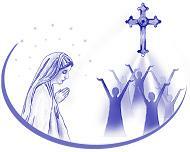 Mary Queen of All Saints Pastoral Council meets on the third Tuesday of every month at 7:00pm in MR# 2. The following is a list of the Members of our Council, please feel free to call them with any comments or concerns you may have concerning our Parish Community. Immaculate Conception Council #3512 meets on the first and third Monday of every month at 7:30PM in the Rectory Basement Meeting Room. New members are welcome to attend. For more information call Larry Painter at 856-662-5927. Anyone from fourth grade through High School interested in serving at the altar. We are accepting any and all prayer requests. No request is too small or too big. If anyone is interested in joining the prayer chain or has a request, please call Marge Croissette at 856-235-4376. Spiritual Reflection on the Sunday Scriptures. Meets on the first Saturday of the month 9:00am in the Rectory Basement. Contact the Rectory for information. Study of Faith and Spirituality. Meets on the first Saturday of the month 9:00am in the Rectory Basement. Provides food for area needy. Coordinates liturgical ministries and prepares Special Liturgies and matters related to our Sunday worship. Meetings are the third Monday of the month in the Rectory. Responsible for budgeting, reporting and analyzing all parish financial data. Meetings are second Monday of the month (except where noted) 7:00pm MR#2. Coffee and donuts served Sunday of every month after morning masses. Fosters activities and programs of special interest to our teenage parishioners. Contact the Rectory at (856) 662-2721 for more information. Looks to the needs and services/programs of special interest to our Hispanic parishioners. Supervision of maintenance of our buildings. Also manages work teams. Promotes partnership of parents and faculty for the betterment of our school and engages fund raising efforts. Meetings are the third Monday of the month. Acting President - Sylvia Williams. Provides Liturgical seasonal decorations in the church.